Here at Apex MD one of our goals is to help patients find solutions to the problems that may be keeping them from reaching their health related goals. All too often I find that we sometimes forget the importance of good hydration. The truth is the need for fluid trumps the needs for food in the human body. When we don’t get enough fluid we are setting ourselves up for a host of problems. Our surroundings, our activity levels and even our body temperature can influence our hydration levels so good fluid intake is vital. However, the fact of the matter is we just don’t get enough! As a nutritionist the biggest complaint I hear from patients is that while trying to avoid the sugar sweetened beverages they either don’t like water or they are simply bored with it. So what are some alternatives to water? Here are some ways to get your fill of fluids, whether at home, on the run or in restaurants, when plain, boring water just doesn’t satisfy. Try club soda, sparkling water or diet tonic water for no-calorie alternatives. Like HINT or La Croix. Unsweetened tea can make a great alternative to water. Green tea is one of the more healthy substances you can drink because it can do so many great things for you. 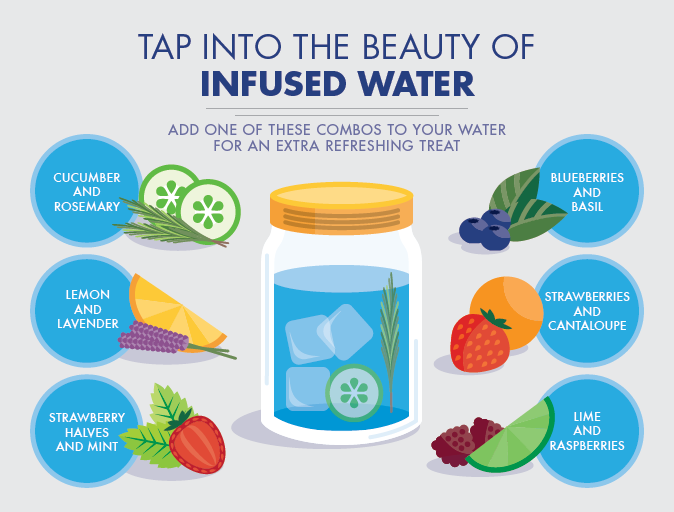 Try infusing your water with natural flavor. This is my favorite water alternative.Infused water is basically made by filling some containers with pure water and fruit (or even cucumbers) and letting it sit for at least 30 minutes. In season fruits have the most vitamin and mineral benefit. Fruit Infused Water can also make a thirst quenching healthy natural preservative free drink when going on an outing.